« Older: 2015 Conch Season is open! Newer: » Holiday Hotel’s Halloween Bash 2015 was EPIC! 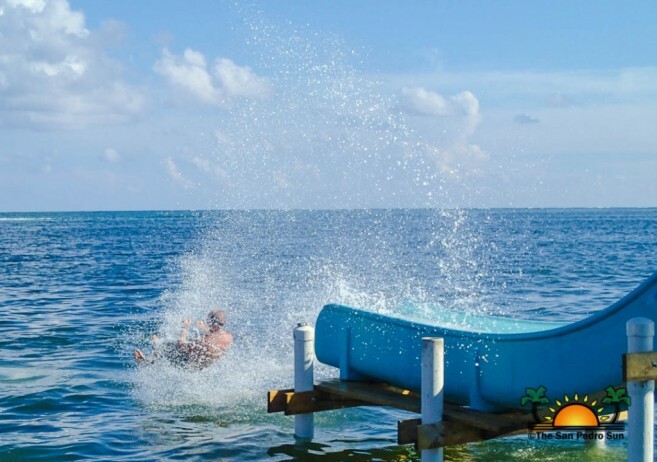 The latest addition to the fun at Caribbean Villas was unveiled on Sunday, October 11th, to a crowd eager to finally test out the newest watersports activity on the island: El Diablo. Peter Lawrence was proud to present the newest toy available for enjoyment at Caribbean Villas. Built by the skilled people at Captain Shark’s, El Diablo is a 50-foot water slide designed for thrill-seekers looking for that quick adrenaline rush. 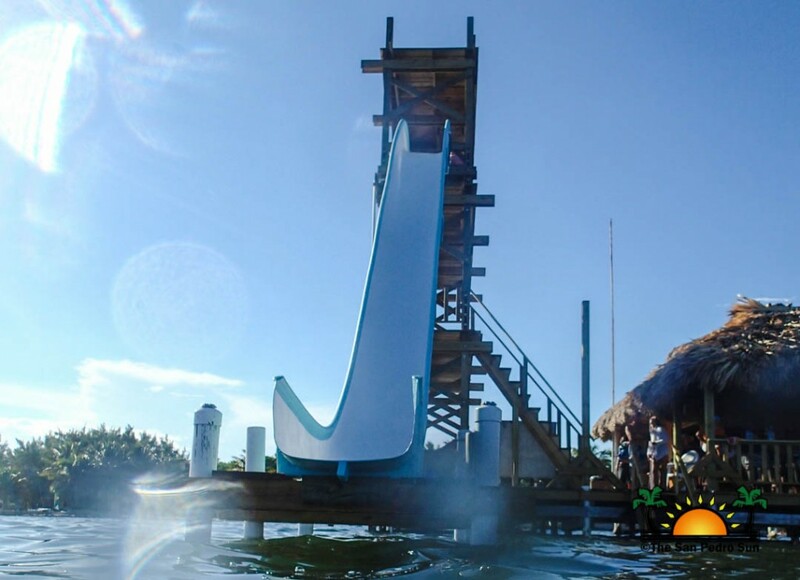 From the top of the two-story slide tower at the end of the resort dock, one can get on the slide, following quick and clear instructions from the guide, and if necessary, a quick push from him will have you sliding down and making a spectacular splash into the Caribbean Sea! The inaugural day saw many eager patrons paying the $5 per turn fee to try out this thrilling contraption. Spectators enjoyed delicious barbeque and other delicious nibbles from Amber Beach Bar & Grill, while DJ Debbie spun the tunes for the day. The San Pedro Sun’s Associate Editor Mary Gonzalez even gave it a shot, and can report that it was spectacularly fun, and totally something to do again and again! While the height might be a little intimidating, once you lie down ready to slide, it’s nothing but pure unadulterated fun! El Diablo is open to the public, at $5 per turn, or $25 for unlimited fun. Those under 18 years of age must be supervised by a parent or guardian. Waivers must be signed and of course, all necessary precautions must be adhered to.